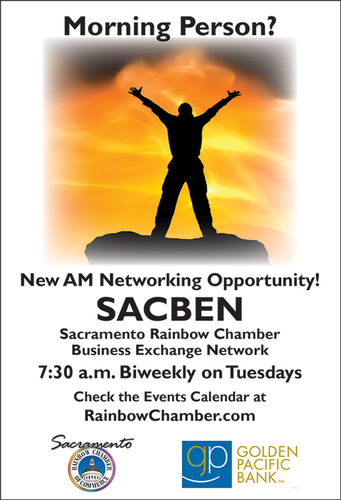 All SACBEN members must be a member in good standing of the Sacramento Rainbow Chamber of Commerce and must maintain membership throughout the SACBEN semester. All policies held by the Rainbow Chamber of Commerce are applicable to this group. A SACBEN member may be absent from a maximum of two SACBEN meetings per trimester. If a current member reaches 2 absences in a trimester, the Group Chairman shall contact the member to confirm that the member is aware of the group’s attendance requirements and ascertain what business and/or personal issues may be affecting that member’s meeting attendance. A third absence may result in termination from the SACBEN group for a period of no more than two trimesters. Reinstatement into the SACBEN group/program is subject to availability. Members are responsible for attendance and referral requirements. A replacement representative who must be from the SACBEN member’s business (a Chamber Member) is permissible. If the allowable number of absences is exceeded, the result will be loss of the member’s position in the SACBEN for two trimesters from the date of removal as noted above. For special circumstances a member of a SACBEN may be granted a leave of absence for the remainder of the semester. Each Group Chairman may use their discretion for issuing a leave of absence. Complaints about other members will not be discussed in the group forum. Issues between members must be dealt with privately. Chamber politics will not be discussed. The Group Chairman should be notified if a complaint exists and they should try to act as a moderator to assist with the problem or concern. If the Chairman is not able to resolve the issue, the problem or concern should be directed to the SACBEN Program Chair and, if necessary, the Chamber president. Each SACBEN Member is responsible for making sure that they have the proper tools for their presentation. If a SACBEN Member needs A/V equipment for a presentation, they must notify the group chair no less than 5 business days in advance of the meeting. Presenters should plan to arrive to the meeting at least 15 minutes early to set-up and test equipment. Multi-level marketing members and other companies offering a business opportunity are welcome to represent their products and services at the SACBEN meetings, but not the business opportunity element of their business.